Ion Ghica (August 12, 1816-May 7, 1897) was a Romanian revolutionary, mathematician, diplomat and twice Prime Minister of Romania (between 1866 and 1867, and between 1870 and 1871). He was a full member of the Romanian Academy and its president for four times (1876-1882, 1884-1887, 1890-1893 and 1894-1895). He was the older brother and associate of Pantazi Ghica, a prolific writer and politician. He was born in Bucharest, Wallachia, to the Ghicas, a prominent boyar family with strong Albanian roots, and was the nephew of both Grigore Alexandru Ghica (who was to become Prince of Wallachia in the 1840s and 1850s) and Ion Campineanu, a Carbonari-inspired radical. Ion Ghica was educated in Bucharest and in the West of Europe, studying engineering and mathematics in France from 1837 to 1840. After finishing his studies in Paris, he left for Moldavia and was involved in the Francmasonic Fratia ("Brotherhood") conspiracy of 1848, which was intended to bring about the union of Wallachia and Moldavia under one native Romanian leader, Prince Mihai Sturdza. Ion Ghica became a lecturer on mathematics at the Academy which was founded by the same Prince Sturdza in Iasi (future University of Iasi). 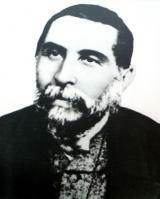 He joined the Wallachian revolutionary camp, and, in the name of the Provisional Government then established in Bucharest, went to Istanbul to approach the Ottoman Imperial government; he, Nicolae Balcescu, and General Gheorghe Magheru were instrumental in mediating negotiations between the Transylvanian Romanian leader Avram Iancu and the Hungarian Revolutionary government of Lajos Kossuth. While in Istanbul, he was appointed Bey of Samos (1854 - 1859), where he proved his leadership skills by extirpating local piracy (most of which was aimed at transports supplying the Crimean War). After completing the task, Ghica was awarded the honorary title of Prince of Samos by Sultan Abd-ul-Mejid I in 1856. In 1859, after the union of Moldavia and Walachia had been effected, Prince Alexandru Ioan Cuza asked Ion Ghica to return. Later (1866), despite being trusted by Prince Cuza, Ghica took active part in the secret grouping that secured Cuza's overthrow. He was the first prime minister under Prince of Romania (afterwards King of Romania) Carol of Hohenzollern. Ghica is also noted as one of the first major Liberal figures in the Kingdom of Romania, and one of the leaders of the incipient Liberal Party. His group's radicalism, with its boyar leadership that had engineered the defunct Revolution, surfaced as republicanism whenever Carol approached the Conservatives; Ghica joined the anti-dynastic movement of 1870-1871 that had surfaced with the Republic of Ploiesti. The matter of the Liberals' loyalty was ultimately settled 1876, with the exceptionally long Liberal Ministry of Ion Bratianu. In 1881, Ghica was appointed Romanian Minister in London, an office he retained until 1889; he died in Ghergani, Dambovita County. Beside his political distinction, Ion Ghica earned a literary reputation by writing his Letters, addressed to Vasile Alecsandri, his lifelong friend. Conceived and written during his residency in London, the letters depict the ancestral stage of Romanian society, as it appeared to be fading away. He was also the author of Amintiri din pribegie ("Recollections from Exile"), in 1848, and of Convorbiri Economice ("Conversations on Economy"), dealing with major economic issues. He was the first to advocate the favoring of local initiatives over foreign investments in industry and commerce - to a certain extent, this took the form of protectionism (a characteristic of the Liberal Party throughout the coming period, and until World War II).